The vast stretches of the Texas-Mexico border region enfold some unusual cultural niches. The mediumnistic healer El Niño Fidencio, who died in northern Mexico in 1938, and his followers, the fidencistas, are unquestionably among the most intriguing of subjects for a history and an enthnography, and with El Niño Fidencio and the Fidencistas: Folk Religion in the US-Mexico Borderland, anthropologist Antonio Noé Zavaleta has just published precisely that. Zavaleta's El Niño Fidencio and the Fidencistas crossed my radar because I did a fair amount of reading on this very subject, including Zavaleta's fascinating book with curandero Alberto Salinas Jr., Curandero Conversations, when I was writing my book on the "secret book," Spiritist Manual of 1911, by the leader of Mexico's 1910 Revolution, Francisco I. Madero. I cannot say for sure, but I doubt that Niño Fidencio and Madero met. Niño Fidencio did not consider himself a Spiritist, and when Madero died in the coup d'etat that ended his presidency in 1913, Fidencio was still a teenaged worker on a remote ranch. But there is an intermediating figure who appears multiple times in Zavaleta's new book: Teodoro von Wernich, a wealthy hacendado of northern Mexico, personality in the San Antonio Texas Spiritist scene, friend and supporter of Francisco I. Madero, and employer, patient of, and mentor to his worker José Fidencio Sintoro Constantino, the boy who became the folk saint revered on both sides of the border as "El Niño Fidencio." 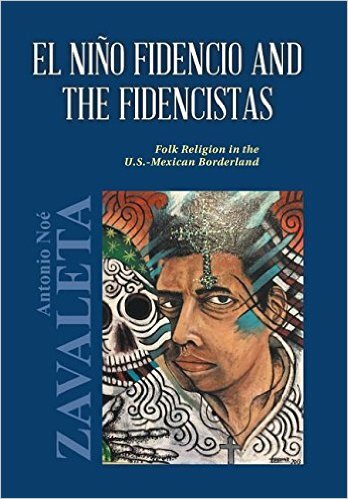 In sum, Zavaleta's latest is a must-read for anyone interested in Niño Fidencio, shamanism, and the cross-border cultures of northern Mexico and South Texas. 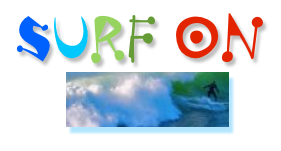 2018 UPDATE: Professor Zavaleta has a new webpage about his research which you can visit here. > Your comments are always and ever most welcome. Write to me here. This finds me working on the book on Far West Texas, and about to resume the Marfa Mondays podcasts (20 podcasts posted so far, 4 more to go, listen in anytime). I just posted a brief video of my visit last November to see, among other wonders and curiosities, a most extraordinary and controversial statue at the El Paso International Airport. Because of the way it is placed, directly behind a grove of extra-fluffy trees, and at the entrance where most drivers, speeding in, are on the lookout for signs, such as rental car return, departures, arrivals or parking, I daresay few passersby would even notice the statue. I myself drove by it more times that I would like to admit before I realized it was there. For "Behind the Lens POV PBS"
"Here it is, look at this and think about it, good and bad, the whole thing. The history." Update: Houser passed away in 2018. Read his obituary here. > Your comments are ever and always most welcome. Write to me here. BIOGRAPHERS INTERNATIONAL: What is your current project and at what stage is it? C.M. MAYO: I'm at work on World Waiting for a Dream: A Turn in Far West Texas, not a biography properly so-called, but the narrative weaves in some history and so encompasses a number of biographical vignettes from Alvar Nuñez Cabeza de Vaca, the conquistador who got lost, to some of the contemporary artists working in Marfa. Stage: still banging out the first complete draft. 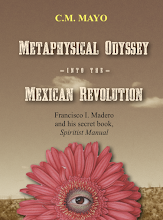 My latest publication, however, is about a major figure of the Mexican Revolution, and that certainly informs the Far West Texas book, for some of the key battles were fought along the US-Mexico border: Metaphysical Odyssey into the Mexican Revolution: Francisco I. Madero and His Secret Book, Spiritist Manual. 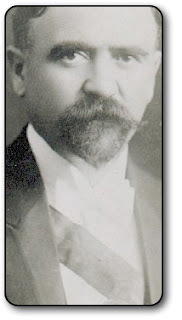 Madero was the leader of Mexico’s 1910 Revolution and President of Mexico from 1911-1913, so the fact that he was a Spiritist medium and, albeit under a pseudonym, author of a book of Spiritism published in—yes—1911, is a dramatic twist in the paradigm of how we understand the spark of the Mexican Revolution. > Listen to and/or read some of my talks about this book here. BI: What person would you most like to write about? C.M. MAYO: At the moment, because I'm writing about Far West Texas, pioneer petroleum geologist Wallace E. Pratt. I am especially intrigued that he would choose to live for many years in a such an isolated place as McKittrick Canyon, deep in the Guadalupe Mountains. It is, in large part, thanks to Pratt's visionary gift that we now have the Guadalupe Mountains National Park. I am very honored to say that I will be one of the artists-in-residence in the Guadalupe Mountains National Park this spring, so I will have the chance to retrace his steps and visit his house. BI: Who is your favorite biographer or what is your favorite biography? C.M. MAYO: As far as my Far West Texas reading goes, I both admired and especially relished the biography of the 20th century bard of Texas, J. Frank Dobie: A Liberated Mind, by Stephen L. Davis. Many of the popular ideas we take for granted about Texas and Texans have their roots in Dobie's works. My two all-time favorite biographies are Nancy Marie Brown’s The Far-Traveler: Voyages of a Viking Woman and Paula Kamen’s Finding Iris Chang: Friendship, Ambition, and the Loss of an Extraordinary Mind. BI: What have been your most satisfying moments as a biographer? C.M. 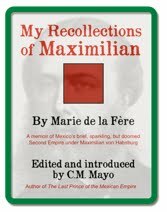 MAYO: I'll answer this for my book on Francisco I. Madero, Metaphysical Odyssey into the Mexican Revolution. 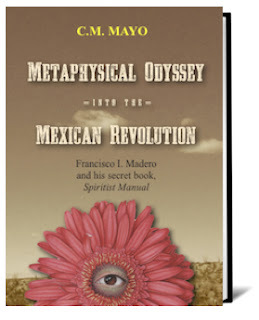 After many years of reading and archival research, it was tremendously satisfying to be able to fit together the pieces of what had been a humdinger of a puzzle—how could Madero be rifle-toting revolutionary and a Spiritist, a savvy political organizer and victim of a coup d’etat?— into a narrative of high strangeness but relative sense. Suddenly Mexico itself looked very different. 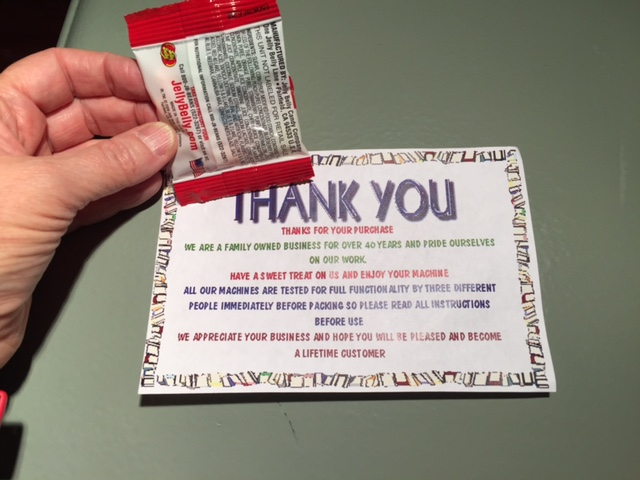 BI: One research/marketing/attitudinal tip to share? C.M. 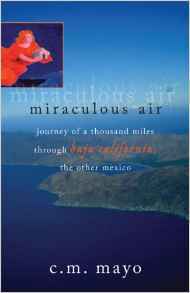 MAYO: As a biographer I have only published the one title, however, I have published several other works of fiction and nonfiction, so I do have more than a little experience about this perennially mystifying and consternating topic. My short answer is three words: sports psychology helps. My long answer is: take consistent resilient actions, answer the email that deserves an answer, write an op-ed if you can, and be generous (what goes around comes around, albeit willynilly). The true reward is in the writing itself. It is a wondrous privilege to be able to write at all. Don't ignore the "publishing business," but don't take it too seriously, either. Books can have deeply strange destinies. After all, they are magical time travelers. BI: What genre, besides biography, do you read for pleasure and who are some of your favorite writers? C.M. MAYO: I mainly read history, literary essay, and literary fiction. Just this year I've come across several historians who are my new favorites: Patricia Nelson Limerick (The Legacy of Conquest: The Unbroken Past of the American West); Jill Lepore (The Name of War: King Philip's War and the Origin of American Identity); and Rebecca Solnit (River of Shadows: Eadweard Muybridge and the Technological Wild West). For literary essay I remain in awe of V.S. Naipaul, in particular, his memoir published in 1989, A Turn in the South. This year I especially admired Shelley Armitage's Walking the Llano: A Texas Memoir of Place and, last year, one of my favorite writers writing on Mexico, Sam Quinones, brought out Dreamland: The True Tale of America's Opiate Epidemic— a grenade of a book, a must read for anyone and everyone living anywhere in North America. Fiction: Agustín Cadena, Truman Capote, Willa Cather, Anton Chekhov, Giuseppe di Lampedusa, Ann Patchett, Leo Tolstoy, Edith Wharton. 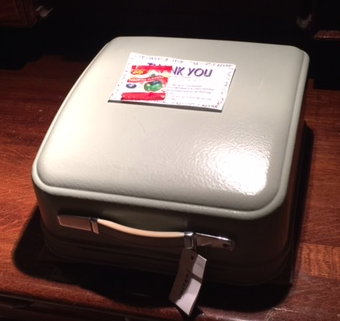 My refurbished 1961 Hermes 3000 typewriter has arrived in Mexico City. Typewriter Techs, the Riverside, Illinois company that refurbished it, shipped it to California in a box so well padded it could have survived a Mars landing; having discarded the packing materials and box, I then grew some new biceps carrying it on board my flight home. I'd say it weighs about the same as a wet brick. It was a loooooong way from the security screening area to the gate. Jack LaLanne, watch out. [[ No, not the French scarf company. The color is just as I had hoped, a foamy celadon (although it looks gray in this photo— too strong a flash). 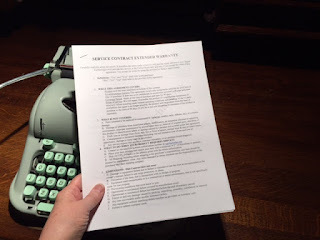 I'm old enough to have had nearly two decades of experience with typewriters, both manual and electric, before I started using a computer in the late 1980s. 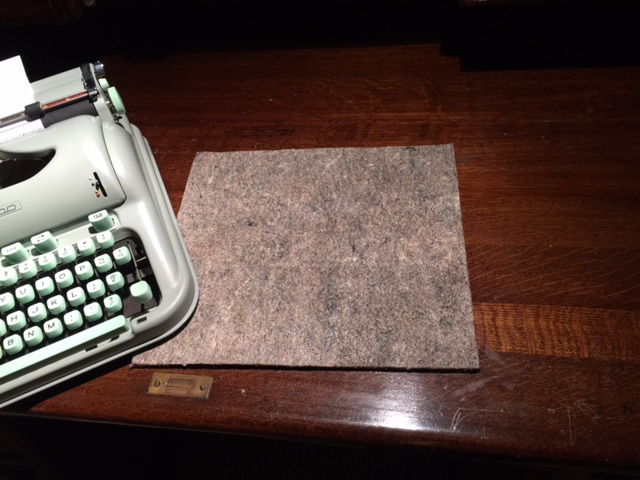 It was an eerie experience to type on a typewriter again... like time traveling. My first attempts at typing on this antique were clumsy, since I am, as are we all, so used to letting fingertips fly over a laptop's keys and making scads of corrections en medias res and whatever whenever wherever and with the benefit of, after penicillin and sliced bread, the bestest thing ever invented: CNTRL Z! 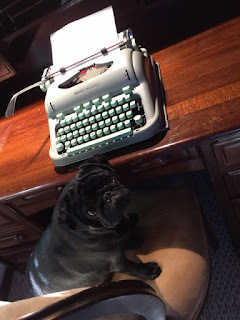 Madam Mayo says, The Anti-Digital Revolution will be Youtubed! And blogged! And, when I get around to it, tweeted! Git yer iron-knee right here, on a spatula! "The 3000 model is a Swiss segment-shifted typewriter with excellent alignment, smooth carriage return, and quality manufacturing, introduced in the fifties. You’ll find it in a wonderfully bulbous body, painted in a color that some call “sea-foam green”... Not the very fastest or snappiest typewriter, but “buttery” in its smoothness, as fans like to say... Users include Larry McMurtry, Sam Shepard, Eugene Ionesco, and Stephen Fry." [[ Watch the interview with English subtitles here. 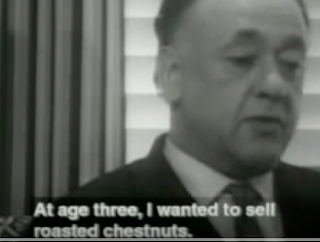 No, alas, Ionesco's Hermes 3000 does not make an appearance. "In the 1950s ribbon sales topped 50 million annually, they were the toner of their day. But unlike toner most typewriters will take the same ribbons. There are several direct replacement ribbons available for most machines. If you cannot find one, don't panic. The ribbon itself is identical, only the spool changes. We recommend you purchase the genetic black., or black and red ribbon and rewind it onto your current spools. This is the least expensive and guarantees a correct fit. You can also contact us we stock a large variety if replacement ribbons. "Cloth ribbons will hold more ink than nylon. Cotton will soak up the ink, nylon it just lays on top of it. A typical ribbon should last about 900,000 characters or about 180,000 words... That's around 500 pages. A good quality ribbon will transfer the ink without leaving excessive ink on the type bars or pages. If the entire type slug is covered in blue, it's probably not a good ribbon to use again. Black only ribbons can be turned upside down and doubled in life." 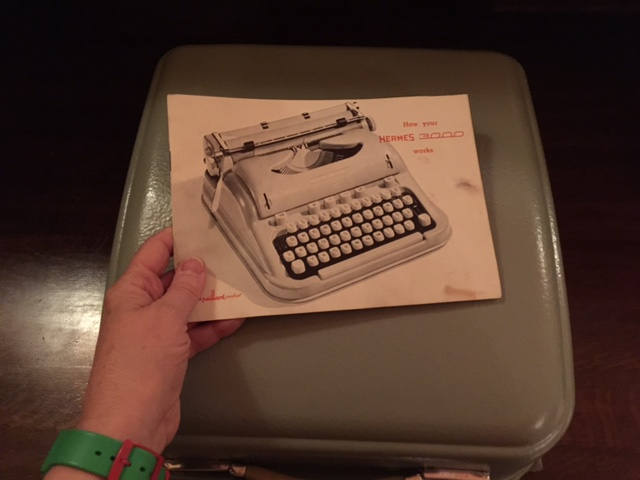 A related and most felicitous purchase was the Jackalope typewriter pad. Definitely it cuts the noise. 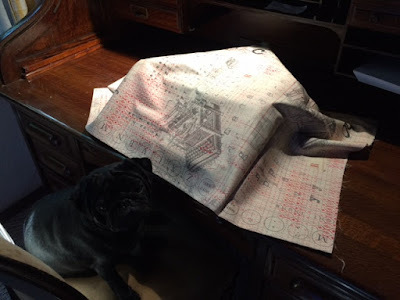 A most thoughtful holiday gift from my sister's dog (yes, in our family the dogs give presents): this yardage of neat-o typewriter fabric and I do like it draped over the Hermes, just so. Nope, I am not going to attempt anything on a sewing machine, the typewriter is my own personal Mount Everest for the moment. Must get typing. Strange, muscled, riven with grief, Blume Lempel's short stories, many set in the U.S., are for the ages. Yet because Lempel wrote in Yiddish, few aficionados of the form have had the chance to read her— until now, with the translation by Ellen Cassedy and Yermiyahu Ahron Taub, Oedipus in Brooklyn and Other Stories. Immigrating to New York when Hitler rose to power, Blume Lempel began publishing her short stories in 1945. By the 1970s her work had become known throughout the Yiddish literary world. When she died in 1999, the Yiddish paper Forverts wrote: "Yiddish literature has lost one of its most remarkable women writers." Ellen Cassedy, translator, is author of the award-winning study "We Are Here", about the Lithuanian Holocaust. With her colleague Yermiyahu Ahron Taub, they received the Yiddish Book Center 2012 Translation Prize for translating Blume Lempel. Yermiyahu Ahron Taub is the author of several books of poetry, including "Prayers of a Heretic/Tfiles fun an apikoyres" (2013),"Uncle Feygele"(2011), and "What Stillness Illuminated/Vos shtilkayt hot baloykhtn (2008)." C.M. MAYO: Can you tell us more about Yiddish as a language, and specifically, its roots and connections with other languages, including German and Ladino? ELLEN CASSEDY & YERMIYAHU AHRON TAUB: Yiddish is a Germanic language written in the Hebrew alphabet. For hundreds of years, it was the everyday vernacular spoken by Jews in Eastern Europe. While Ladino became the Spanish-inflected language of Jews in the Mediterranean region, Yiddish was the everyday language among Jews living farther north, in Germany, Russia, and Eastern Europe. YERMIYAHU AHRON TAUB: There is an alternative theory that Yiddish is essentially a Slavic language, but most scholars believe it’s a Germanic language. ELLEN CASSEDY: For me, Yiddish is a holy tongue. Translating Yiddish connects me to a history, an enduring cultural legacy. Yiddish is precious to me for its outsider point of view, its irony, its humor, its solidarity with the little guy, its honoring of the everyday. YERMIYAHU AHRON TAUB: The Yiddish language has been a crucial tool for my literary work. As a bridge to the past and an enhancement of my literary and social present, Yiddish opens a vibrant linguistic plane, full of texture, play, and reference. Yiddish is for me a place of primal connection and, for all its and my "baggage," a source of strange comfort. Writing, reading, and translating Yiddish also allows me to learn new Yiddish words and re-learn forgotten ones. C.M. MAYO: You write in the introduction that for Blume Lempel the "decision to write in Yiddish was a carefully considered choice." 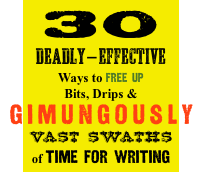 What do you think motivated her to write for what was already a quickly shrinking readership? Writing in Yiddish also afforded a kind of "privacy." Lempel wrote about subjects considered taboo by other writers – abor—ion, rap—, erot— imaginings, even inc—st. * Would she have felt free to exercise the same artistic freedom in English? Perhaps not. But if Lempel needed privacy for artistic freedom, she also wanted recognition and worked hard to get her work out to a wider audience. Her efforts paid off. Over the years, she won widespread admiration among Yiddish writers and readers and received numerous Yiddish literary prizes. C.M. MAYO: What do you think would have been lost in these stories had Lempel written in English? This is another way of asking, what were the biggest challenges for you as translators? ELLEN CASSEDY: I don’t put much stock in the idea that some literary qualities can be expressed only in their original language. For me, what’s important is the fluidity and freedom that Lempel herself experienced, which resulted in the extraordinary richness of her prose. I’m not sure she could have attained such heights in a language that was not part of her very being from girlhood on. YERMIYAHU AHRON TAUB: As we translated, we encountered surprises at every turn—in virtually every paragraph, and on every page. Lempel’s prose is so poetic and rich that we had to exercise special care to capture her unique melody. Sometimes we had to accept uncertainty, realizing we wouldn’t be completely certain of Lempel’s meaning even if her text had been written in English. It was immensely satisfying to work with a partner, to be able to bounce ideas off each other, and to know that our interchange would strengthen the final version. ELLEN CASSEDY: Lempel’s narrations move between past and present, often several places on the same page, from Old World to New, from fantasy to reality. Imagine the conversational matter-of-factness of a Grace Paley combined with the surreal flights of a Gabriel Garcia Marquez. C.M. MAYO: Can you also talk about how it was to work together as co-translators? ELLEN CASSEDY: Working together was a joy. Once we’d selected the stories, each of us chose our favorites and produced first drafts. Then the other one carefully went over those drafts and made suggestions. I was brought up to pay very close attention to the wonders of the English language. Every family dinner included at least one trip to the dictionary. I brought that intense involvement with English to the translation table. YERMIYAHU AHRON TAUB: Working together has been joyful, yes... but also humbling. One had to be open to another's suggestions and feedback throughout the process. There was a lot of give and take, back and forth about meaning, the best turn of phrase, etc. Of course, every book, even one by a single author (and no translators), is a collaboration of some kind—with the publisher, editor, cover artist, designer, etc. But collaboration on the text— of every word of it—is much more so. I've learned a great deal from this process—about translation, about myself ... and about Ellen! Of course, this collaboration is still an ongoing process, as we complete interviews and embark on speaking engagements on behalf of the book. I feel so fortunate to be working with Ellen. ELLEN CASSEDY: Back at you, dear partner! C.M. MAYO: Do you think Lempel's visibility as a literary artist, and her life, might have been different had she written in English? ELLEN CASSEDY & YERMIYAHU AHRON TAUB: Absolutely. The Yiddish literary circle after World War II was far-flung but cohesive, and she thrived within it. Yiddish publications all over the world carried her work. She received prizes in Israel, Canada, and the U.S. When she died, the Yiddish paper Forverts wrote: "Yiddish literature has lost one of its most remarkable women writers." Despite her success within the Yiddish literary sphere, though, she always dreamed of an English-language readership. Although a few individual stories of hers appeared in journals and anthologies, there has been no full-length collection in English until now. It’s a joy for us to help her unrealized dream come true. C.M. MAYO: What inspired you to translate Yiddish? 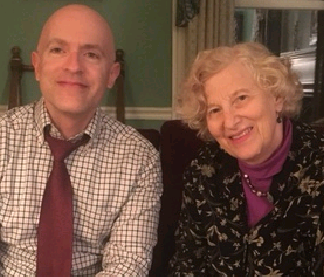 ELLEN CASSEDY: Years ago, when my Jewish mother died, I decided to study Yiddish as a memorial to her and a way to sustain ties with my Jewish forebears on both sides of the Atlantic. I was also looking for a home within Jewish culture, and I hoped Yiddish language and literature would provide that home. And indeed it has! YERMIYAHU AHRON TAUB: Yiddish was a part of the ultra-Orthodox yeshiva world in which I was raised. I studied it formally as an adult and have been engaged in Yiddish culture since the early 1990's. C.M. MAYO: What brought you to translate Blume Lempel? ELLEN CASSEDY: Early on, when I told my Yiddish teacher I wanted to try my hand at translation, he went to his bookshelf and pulled out a little volume– Blume Lempel’s first collection, personally inscribed to him by the author. When I met Yermiyahu Ahron Taub in a Yiddish reading group, we decided to look into this volume. 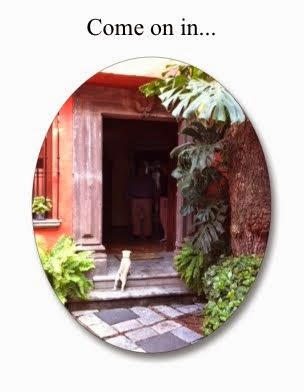 We were astounded to find truly unique writer with a dazzling lyrical style, an unparalleled compassion for her characters, a startling diversity of settings, and a daring range of subjects. YERMIYAHU AHRON TAUB: It didn’t take long for us to decide we had to translate these splendid stories so that they could reach the wider audience they so richly deserve. C.M. MAYO: If you could select one short story as the most representative of her work, which one would it be, and why? ELLEN CASSEDY: It’s hard to choose, because Lempel’s range of settings and characters is huge. She tells truths about women’s inner lives that I’ve never encountered anywhere else. “Waiting for the Ragman” is particularly rich in its description of life in a small Eastern European hometown, including a loving description of preparation for the Sabbath. 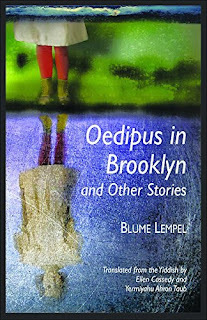 And I have to mention the title story, “Oedipus in Brooklyn.” Lempel masterfully draws you into the story of a contemporary Jewish mother and her blind son as they move inexorably toward their doom. YERMIYAHU AHRON TAUB: “Her Last Dance” tells the story of a Jewish woman forced to rely on her wits and beauty to survive wartime Paris. Despite its small scale, it evokes for me the work of Irène Nemirovsky and Nella Larsen (Passing). In capturing the desperation of a woman on the edge, it reminds me of Edith Wharton’s The House of Mirth. “The Invented Brother” captures the poignant emotions of a young girl whose beloved older brother is swept away into revolutionary activity. C.M. 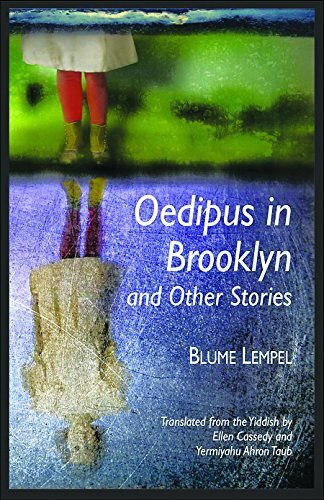 MAYO: In one of the many blurbs for this collection, Cynthia Ozick calls Blume Lempel "a brilliantly robust Yiddish-American writer. Why should Isaac Bashevis Singer and Chaim Grade monopolize this rich literary genre?" ELLEN CASSEDY & YERMIYAHU AHRON TAUB: Avrom Sutzkever, the “dean” of postwar Yiddish poetry, was an admirer, and a mentor. She was admired by other leading Yiddish writers as well, including Yonia Fain, Chaim Grade, Malka Heifetz-Tussman, Chava Rosenfarb, and Osher Jaime Schuchinski. And yes, she did know the New York poet Menke Katz. We found several warm letters from him within her papers. C.M. MAYO: Of those writers not writing in Yiddish, which were important influences for Lempel? ELLEN CASSEDY & YERMIYAHU AHRON TAUB: She was one of a kind. When an interviewer asked which writers had influenced her, she mentioned Sigmund Freud, the father of psychoanalysis, and the philosophers Spinoza and Bergson, but only in passing. She didn’t feel part of any school or tendency. The key to reading this amazing writer is to approach her work without preconceived expectations of what fiction should be. Open yourself up to the twists and turns, the possibilities. You’re in for a wild and wonderful ride. C.M. MAYO: How do you see the future of Yiddish? YERMIYAHU AHRON TAUB: That's a big question. Yiddish is still the lingua franca of various Hasidic communities in Israel and the Diaspora. One can see Yiddish signs, for example, in Monroe, N.Y., Monsey, N.Y., and Williamsburg, Brooklyn, among numerous other places. Of course, Hebrew encroaches in Israel, and English encroaches in the United States. Still, I don't foresee Yiddish fading away in those communities any time soon. Hasidic communities believe in Yiddish as a bulwark against the encroaching "dominant" culture. In terms of secular Yiddish culture, a small number of families are committed to raising their children in Yiddish. And there is considerable artistic and intellectual activity in the realm of Yiddish culture – panels on Yiddish at Association for Jewish Studies conferences, concerts, gatherings, and festivals dedicated to Yiddish, and releases of books and compact discs. Translation is a particularly rich area of contemporary Yiddish culture. A recent anthology called Have I Got a Story for You: More Than a Century of Fiction from the Forward (Norton, 2016), edited by Ezra Glinter, demonstrates the work of numerous Yiddish translators active today. Of course, some would argue that that itself is a sign of demise. I don't see it that way. Translation requires knowledge of both linguistic contexts. Do I think all of this qualifies as a rebirth? Not exactly, but nor do I see Yiddish as dead, dying, or even endangered really. C.M. MAYO: Have Lempel's stories had an influence on you as a writer, and if so, how? YERMIYAHU AHRON TAUB: It's hard to know if Lempel's stories have influenced me as a writer or if I was drawn to her because of my pre-existing interests. Certainly, we both share an interest in the realms of the marginal and the "outsider," although we might have differing perceptions of who is marginal or an outsider. We also share an interest in poetry and poetic language, and the blurring of the line between poetry and prose. I certainly consider Blume Lempel to be a kindred writerly spirit and an inspiration. C.M. 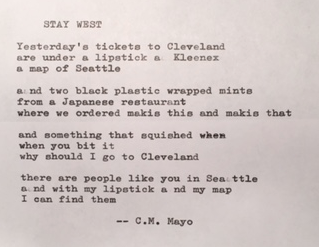 MAYO: What's next for you as writers and translators? ELLEN CASSEDY: I’m currently seeking a publisher for my translation of fiction by the Yiddish writer Yenta Mash, who grew up in Eastern Europe not far from Blume Lempel. I’m excited to have won a PEN/Heim translation grant – the first ever for a Yiddish book – to support this work. YERMIYAHU AHRON TAUB: A new collection of my poems is currently in the publication process. 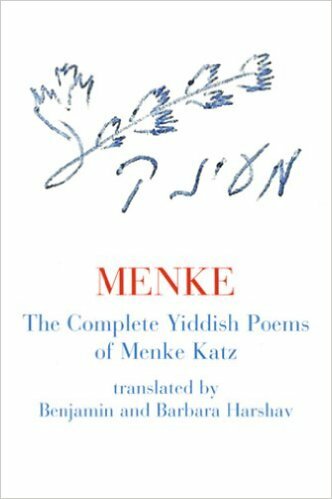 Six of the poems also have a Yiddish version, which raises all sorts of translation and design challenges. ELLEN CASSEDY & YERMIYAHU AHRON TAUB: And of course we’re getting the word out about the Blume Lempel collection. It’s exciting to introduce English-language readers to these stories with their dazzling prose and their bold approach to storytelling. P.S. 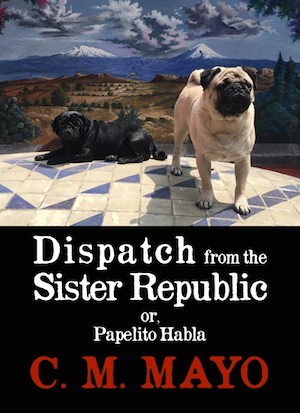 Philip K. Jason gives Oedipus in Brooklyn a rave review in The Washington Review of Books. The event is free with no reservation required.